Knowing that image is everything in the trash industry, kmG Hauling has developed a more strategic and environmentally effective method when dealing with all refuse matters in order to ensure that the company remains innovative and is seen as an industry leader that places emphasis on customer service. kmG Hauling, Inc. (Potomac Falls, VA) is a specialized minority-owned family waste removal company. Operating in the Washington Metropolitan area since 2001, the company provides services to both commercial and residential entities. kmG Hauling has gained a superior reputation in the waste industry because of the expertise and experience of its personnel and the ability to address customers’ waste needs. kmG Hauling’s management team has more than 100 years of experience in the waste industry. Growing up in the family business, Founder and President, Hugo Garcia, realized that trash service was more than a family business and set out to learn all aspects of the business. He first started working with his father at the age of 15, learning waste management from the inside out. He took a break to pursue his Bachelor’s Degree in Exercise Science and Physiology while obtaining a minor in Business Administration from George Mason University. While following his aspiration to be an NFL Coach, he was hired to be an Assistant Strength Coach for the Washington Redskins for eight years. 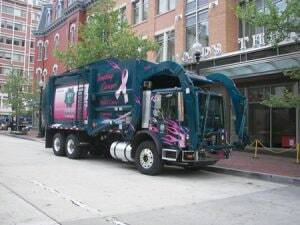 kmG Hauling, Inc. trash truck servicing Washington, DC. Garcia’s heart remained with the family business, and he returned to the waste management industry in 2001, when he founded kmG Hauling. The lower case “k” is in honor of his son Kyle, the lower case “m” is in honor of his daughter Miranda, and the capital “G” for the family last name, Garcia. The kmG family continued to grow by adding daughter Kaylie, and son Konner Maddux Garcia to the family, where he gained the entire “kmG” initials. Knowing that image was everything in the trash industry, the concept of kmG Hauling was to develop a more strategic and environmentally effective method when dealing with all refuse matters. Hugo’s primary focus has been to ensure kmG Hauling remains innovative and seen as an industry leader that places emphasis on customer service and the idea to bring a whole new concept and ideology to the trash industry. Today, kmG Hauling services Washington, DC and Northern Virginia, including Alexandria City, Arlington County, Fairfax County, Loudoun County and Prince William County, as well as parts of Montgomery and Prince George’s Counties in Maryland. The company has more than 100 employees and runs a fleet of more than 70 trucks daily. The fleet consists of front-load, rear-load, roll-off and open-body trucks. kmG Hauling is equipped to provide front and rear loading container service, bulk debris removal, curbside hand collection, construction debris removal and recycling services such as cardboard, mixed paper, bottles, cans and plastics. They also handle scrap metal and cardboard bales. Because the number of third-party disposal and recycling facilities is somewhat limited in this market area and flow-control is also a factor, kmG Hauling is not able to directly control the trash disposal or recycling processing fees they pay, so the fees have increased steadily on an annual basis. “Salaries, insurance, fuel, and other operational costs increase every year, as well. As an example, the price of diesel fuel alone has jumped over 17 percent in the past year. In order to control these costs as much as we can, we continually review our expenses. In addition, to keep our margins at an acceptable level, we adjust our rates to our customers in order to cover these increased costs,” says Garcia. When it comes to training, kmG Hauling’s applicants are first given a road driving test. Once that is passed, a pre-hire drug test is then completed, along with the background investigation. If all is okay, the applicant is scheduled for an eight-hour orientation classroom training. The applicant is then assigned to ride in the field for two days with a driver trainer. On day three and four, the applicant drives and the trainer observes and continues the training. Once all training requirements are passed, the decision is made on where to place the applicant in the field. Office personnel is also required to take part in drive alongs with a driver to give them a complete understanding of outside operations. Safety meetings are held once a month and require mandatory attendance from all operational staff. Safety videos are provided to improve driver awareness and current route situational scenarios to improve overall performance. kmG Hauling currently has 12 mechanics onsite to handle any and all vehicle repairs needed. Monthly Preventative Maintenance programs are assigned to all 70 vehicles on route, which attest to having their oldest truck of 15 years on the road and running well. The company also currently uses GPS tracking on trucks to ensure timely pickups and customer satisfaction. All of their routes are computerized and tracked on a daily basis for driver reliability and accuracy. kmG Hauling takes pride in engaging with the community as well by going to local schools and creating events such as “Touch the Truck” and “Earth Day” events. 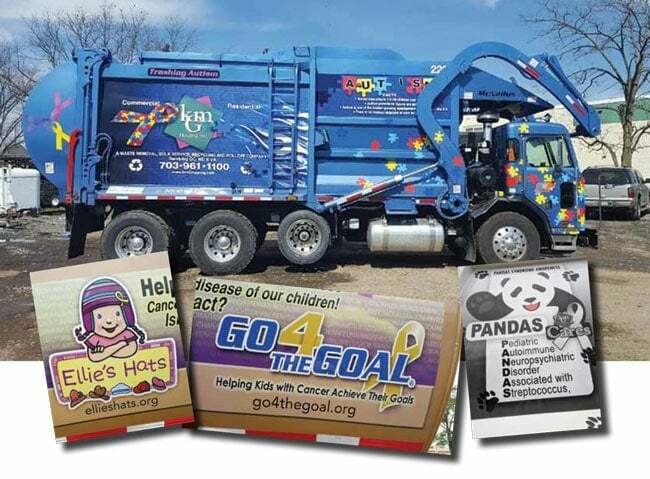 The kids love it and it helps to spread the awareness kmG Hauling brings to the waste industry. “With our unique truck designs, just being on their regular route, kmG is reaching out to the community to bring awareness to the several causes,” Garcia says. He points out that the company is most proud of their ability to use our fleet of trucks to raise awareness of various causes. “We have trucks, that are specially designed and painted in colors associated with specific causes, such as Pink for Breast Cancer, Gold for Childhood Cancer, Purple for Pancreatic Cancer, Blue for Autism, Black and White for P.A.N.D.A.S. Syndrome, and Black to honor the Wounded Warriors in the military. All of these causes have impacted family and friends within our company in one way or another. Being able to spread awareness of these causes every day is very humbling. We have also created a color pinwheel that we use in our printed material, which is made up of the ribbons associated with each of these causes and centered by a paw-print for P.A.N.D.A.S. kmG Hauling will also be unveiling one last Awareness truck in the fourth quarter of 2019 to bring Type 1 Diabetes to the forefront. “My father contracted the illness about five years ago and it seemed fitting to end on this note,” says Garcia. kmG Hauling fleet of trucks. kmG Hauling continues to think of innovative ideas to help keep them the leader in the industry when it comes to service and branding. They feel that the “Zero Waste” initiative is forming rapidly and will continue to work with landfills and energy transfer stations to reduce waste and not just waste removal. For more information, call (703) 961-1100 or visit www.kmghauling.com. *Proudly bringing awareness to Pancreatic Cancer, Breast Cancer, Childhood Cancer, Children’s Autisim, P.A.N.D.A.S. Syndrome, Wounded Warriors and Type 1 Diabetes.